I remember 1989 very well. What an exciting year. I wish others in high office rememeber it too. Excellent work here. Thanks for reminding us. Nice! Very good info here. Thanks Albert – glad you stopped by. Thanks for reminding. As an immigrant from the ex-Soviet Union, I still remember (on the level of childhood perception) the horrible 90-es.. Thanks for the comment, ostrix. I’m glad we can call each other fellow Americans. If you ever write about your perspective on those days, I’d love to read it. agree as for a good info. it really can be seen that 1989 was very special year with a lot of different events. i am sure that the majority of people do not know about these events! thanks for such a good post! Thanks Jimmy. I agree that the fall of Communism is an understudied fact — have we ever done anything so significant without erecting a monument to it, for example? Hopefully this post will do a little bit to educate folks on these monumental times. Please stop back by Marque’s Letters again sometime. My parents were in the baltic Road. I still remember my history teacher shouting and giving out about the communists only a few years ago. I still remember the tales my parents told of how they were ‘guarding’ radio and tv stations along with other peaceful (or not so much) demonstrators. Except it wasn’t a demonstration, was it? They locked themselves in, and hoped the tanks wouldn’t burst through the door (or militia with guns). I remember the numbers that were crushed by the tanks. For singing. The military is always scared of singing people, I was never sure why. And even though I do remember all this, through this year, I never once thought that there’s an aniversary to celebrate. Thank you for a reminder, and the rush of patriotism that makes my heart beat faster. Urbanechoes, thanks for your moving comment. I’d love to hear from you what happened – what clicked in people’s minds – that made it the right time to take a stand. I’ve read my share of history, and I know all about perestroika and glasnost and such, but it still takes such incredible courage to stand in the way of the tanks. Your thoughts? If those like you, whose family members saw these events firsthand, can forget these anniversaries, then how much more important is it that we make an effort to remember them as a society? Thanks again for stopping by Marque’s Letters — hope you’ll make it habit. Am surprised the Western world is not making more of these anniversaries, seeing as Western capitalism seems to assume that the demise of the junta-like Soviet state meant the death of socialism. I can’t put my finger on it either, Steven. But it may be precisely BECAUSE the Western world considers the death of Communism to be a symbol of the failure of socialism that we don’t focus on these historic events. Some would say that socialism is again on the march, at least in the U.S., and reminding us of all the effort we once put toward ending its most virulent form may be a deterrent to installing it further here. Thanks very much for stopping by Marque’s Letters. I look forward to checking out Doctor Beatnik. Great post and wonderful reminders of important dates in history we should pause to reflect upon! Thanks for stopping by Marque’s Letters, Pretty — hope you’ll do so again soon. I’m korean so our country still has a wall. Sadly so, sunny. But I think the stories of 1989 show how quickly and decisively freedom can break out in places that were relegated to despair by conventional wisdom. That fact gives me hope that someday, North Koreans will once again walk the lost acres of the DMZ with their South Korean brothers and sisters. Thanks very much for the comment. I have stood at the “line” in Panmunjom. It is a sobering thing. I regret that such a small line separates such a great people. Great idea. There are so many other attempts at raising consciousness on campus that are directed at far less laudable causes. Good luck, folks. Wow, now I feel old…. Glad to introduce you to your past, Yura! Hope to see you again at Marque’s Letters. What it shows is that Americans weren’t that into the Cold War all those years anyway. And nowadays, no one wants to commemorate 1989 because it just reminds everyone that was 20 years ago already and we’re all a bit older than we’d like to be. Ask anyone under 30 what the “Soviet Union” was even and they might not know it was a country. Getting out those 2010 calendars will be effort enough . . .
As one who was a teenager in 1989, I can definitely say that Americans were “that into” the Cold War. Sure, it didn’t influence where you got your morning cup of coffee, but it was the background to everything geopolitical. There’s simply nothing to compare it to in modern culture — it was. And then it wasn’t. And thank God it isn’t. A lot of similarities in 1989 and 2008. Both years saw long standing issues coming to a head. 1989 showed how communism cannot work on a grand scale, and 2008 showed how unabated and unregulated capitalism cannot work on a grand scale. There needs to be a happy middle ground. We need to stop with all the demonization, and just get to work fixing the problems and reforming the broken systems. unclerave, I might agree with you – if we were seeing “unabated and unregulated capitalism on a grand scale” in 2008. But the story of 2008 is meddling by government in the mortgage marketplace to achieve politically-preferred results. Those results were achieved, but at the cost of market stability. Banks loaned to subprime borrowers because they were ordered to by the Justice Dept and the FHA; the subprime mortgage market was created by Fannie and Freddie to allow people who shouldn’t have bought houses to do exactly that; mortgage rates were kept low because the government loved the politics of the boom; and the rising rate of home ownership were seen as an end in itself, not a sign of some greater healthiness in the economy or a broadening of wealth. No, the mortgage crash, which brought on the financial market crash, was the inevitable result of a government-imposed goal: everyone gets to own a home. The government didn’t care whether this meant bad borrowers got loans, or if those bad loans got aggregated into bad securities, or if those bad securities became the junk bonds of our era. The party depended on collective ignorance of structural risk, and the whistleblowers were considered party-poopers. There is no worse buzzkill, though, than waking up on the sidewalk with your stuff after you’ve been evicted. The U.S. was evicted from its dream home when it could no longer be ignored that it was just a dream. Thanks very much for the comment, though. I happen to think you’re right that moderation should be sought — I just think the moderation lies in the opposite direction. A very moving tribute to the courageous men and women of that year. How sad that we are so forgetful of those so brave who believed in something so much better than what they had. You’re post was good till you got to this point. Consider that you, dear reader, live in the nation whose steadfast defense of the West and demands for freedom for those behind the Iron Curtain gave hope to millions. In a year when we are beset with troubles and our troops are again defending freedom against tyranny, why are we Americans not being reminded of the defeat of Communism around the world? Trust an American to take credit for the blood, anguish and courage of the eastern europeans, then absurdly try to lead some pathetic link to your second vietnam in Iraq. Is a recognition of contribution tantamount to “taking credit for the blood, anguish, and courage of eastern europeans?” I don’t disagree that none of this would have been possible without the citizens of the Eastern Bloc taking their future into their own hands. But I think it’s appropriate for Americans to feel proud of their role in preventing the spread of Communism and for decades of support for the resistance. The Berlin airlift, Radio Free Europe, the hundreds of thousands of American troops who stood guard against a Soviet invasion of the West…I could go on, but it’s pretty much incontrovertible that the United States was a critical player in bringing about the end of Communism in Europe. There is no shame in being proud of that. As for calling Iraq our “second Vietnam,” it’s funny – pretty much every foreign conflict we’ve been engaged in since Vietnam has been called our “second Vietnam.” To date, we’ve had one Vietnam. Iraq, however, is a very different story, one far better for the people of that nation. Without American intervention, Saddam Hussein would still be ruling that country with an iron fist. Instead, it is a rather robust democracy, still getting its sea legs, but largely capable of governing itself. The comparison with Vietnam is really pretty ridiculous at this point. Note, also, that all I said was that American forces are defending freedom against tyranny around the world. That has been true for over two hundred years, whether in direct conflict or as a passive defense force. At the moment, U.S. troops are busy trying to defeat al Qaeda and the Taliban in Afghanistan. If you question whether this effort is really an attempt to defend freedom against tyranny, I question whether the events of 1989 have taught you much at all. I think that the Vietnam analogy is tired and, as Marque aptly points out, completely irrelevant to Iraq. You should really come up with a different comparison. In fact, I would offer that the results in Iraq actually support Marque’s point here. There is a far greater parallel between Iraq and the America-led destruction of the Iron Curtain than the politically reluctant police action in Vietnam where we basically failed to fully exercise American resolve. What both of these cases show us is that when America leads the charge for human rights and freedom, victory is likely. When it steps away from the plate however, there is little to fill the void. In fact, I would say that you have missed the point entirely. Wow, great post. I had forgotten all that stuff happened that year. I was only nine, but I still remember all this stuff being in the news. It’s only now looking back I realize how earth-shattering all that stuff was. Thanks Jason – sorry about your Bucks. Glad you stopped by the Letters. Well done! I was 25 in 1989 and I remember all of this, I had forgotten it was all in the same year. I wonder if the Estonians, Latvians, and Lithuanians are celebrating the fall of the Soviet Union this year? 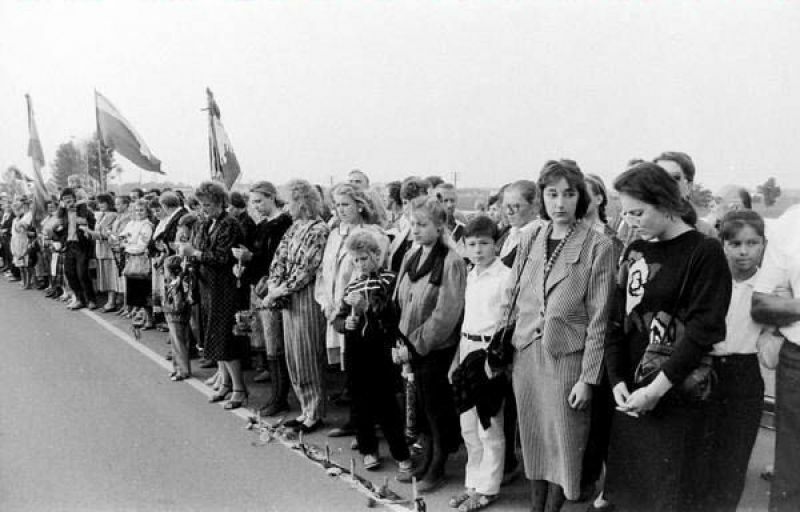 I think the Soviet anniversaries mostly fall in 1990/91, but yes, the Baltic peoples have a lot to be proud of in 1989, as well. Thanks for the comment. Not true. I have seen news reports and a documentary on the 20 year aniiversary of the beginning of the end of Communism here in the UK. Nothing about my 20 year wedding anniversary though. Glad to hear it, sir. I wish it were so in the U.S. And congratulations on your anniversary! At least it isn’t missing…. Kudos to you on this post. Wonderfully conceived and written! It may be my favorite of all your posts to date. You capture something here that we all need to remember. American resolve when it comes to freedom and human rights can truly change the world. Sure others stepped up, but it is the light from the “shining city on the hill’ that illuminated the way. We must never forget what we stand for and what good we can achieve when we have resolve. Chuck, thanks – as one who greatly respects your writing, your appreciation is much appreciated.